World book day is a fantastic celebration of storytelling throughout the world. Stories are the way we connect to each other, the way we teach each other and the way that we inspire each other. Nowadays stories are no longer confined to paper; films and video provide completely new mediums in which to stretch our storytelling muscles in. Text based adventure games have been around since the earliest days of video gaming. They draw inspiration from choose-your-own-adventure books and roleplaying games such as Dungeons and Dragons. They allow users to dive into another world, to explore the deepest and darkest scary caves on quests in order to unlock something amazing. In computing there is nothing more scary to a young programmer than the Terminal with its black background and white text. It’s a fabled, almost magical place where powerful commands can be used to do amazing things. But all of that power doesn’t come without danger. Forums everywhere tell of how certain commands can damage your computer or delete all of your work. Even the help files (called ‘man pages’ in Terminal) offer little solace to a young terminal user; unhelpful and inaccessible they don’t help us to understand the powerful tools that Terminal can offer us. Caroline Clark, one of our software developers and author of Terminal Quest, remembers her initial forays into the world of the command line and wanted to find a way to make it accessible for everyone. What better way than a story! 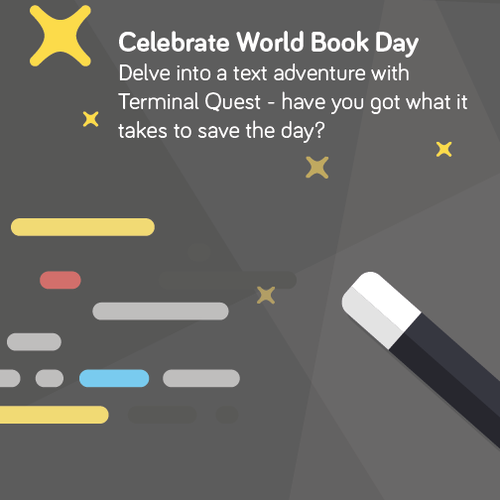 Terminal quest throws the user into a text based world that you can explore and interact with using terminal commands. Want to look around and see where you are? ‘ls’. What to examine a clue? ‘cat’! But why is Terminal important? It’s fast, it’s powerful and it’s indispensable to a programmer. It lets you dig beneath the nice graphical interface that your computer has and allows you to not only do tasks quickly but get a full understanding of the processes and functions that your computer is doing. Caroline puts it fantastically when she describes the commands in Terminal as ‘a toolbox, like any powerful toolset you can’t be afraid to use it, you just need to be shown how to’. Want to try out Terminal Quest for yourself? Make sure your Kano is updated and you’ll see the Terminal Quest icon appear on your desktop. Delve in and explore!